Our objective with the R & R program is to Remove interference and Rebuild the neurosensory system to allow for improved neurological function and optimal performance. The quality of life of more and more children, parents and families is suffering and it's time to get to work to put a stop to it. If you are a parent, educator, therapist, counselor or anyone else that wants to help kids with these conditions, we invite you to arrange a meeting for Dr. Prentice to come and speak. Anytime, Anywhere. Simply gather at least 2 parents or interested parties together and we'll be there. Whether it's two sets of parents in a living room or 200 parents in an auditorium, if you set it up, we'll be there. Simply contact our office and we'll make it happen. Children are at stake. Families are at stake. Lives are at stake. ​Proper movement of spinal bones plays an integral role in the optimal function of the nervous system. Because of the intimate relationship between the spine and the nervous system, subtle misalignments of spinal bones will commonly cause neurological dysfunction which often contributes to developmental difficulties. 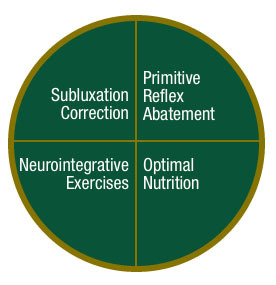 Neurological interference as a result of spinal misalignments is called a Subluxation. Subluxations are corrected with gentle chiropractic adjustments and are essential to allow optimal function of the nervous system. By removing this primary source of neurological interference we give children the best chance to benefit from the other parts of the R & R program. 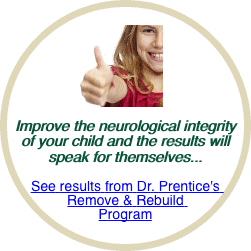 All children are born with hard-wired neurological reflexes that are necessary for survival. These reflexes, while essential in the early stages of life, are normally integrated by the brain and disappear by the child’s first birthday. This allows the brain to move on to higher levels of development. When these reflexes are still present after age 1, they are said to be retained. Retained Primitive Reflexes will interfere with normal neurodevelopment and will contribute to problems with learning, behavior, emotions, coordination and fine motor control. Retained Primitive Reflexes are virtually always found in children struggling with neurodevelopmental disorders including ADD/ADHD. Primitive Reflex Abatement is the process of helping the brain integrate the retained reflexes which removes a major obstacle to optimal development. The neurosensory system is made up of several senses that allow the brain to interact with the environment including the visual, auditory, olfactory, taste, tactile, proprioception and vestibular system. When functioning properly, these senses constantly relay information into the brain where it is then processed and used by the brain to determine an appropriate response. Sometimes the sensory system can become dysfunctional with problems arising either in the transmission or processing of sensory information with the end result being distortion in the sensory system. This will also contribute to developmental difficulties, emotional problems, behavioral issues and learning disorders in children. Specific exercises designed to rebuild the sensory system are called Neurointegrative Exercises. By training the various sensory systems of the body to work together we can remove another major obstacle to optimal function and performance. In many children, nutritional concerns may be contributing to the neurological dysfunction they are experiencing. Food sensitivities and toxicity will often manifest as emotional/behavioral changes, sleeping problems and/or learning difficulties due to the intimate relationship between the immune system and the nervous system. Chronic chemical stress to the nervous system by toxins, chemicals or an inappropriate diet will cause significant challenge to the immune and nervous system. By addressing any nutritional deficiencies or sensitivities that may be present we are able to remove another major obstacle to proper development and performance.